42, as all fans of Douglas Adams and The Hitchhiker’s Guide to the Galaxy will instantly tell you. In the years before he produced his best-seller, a chance contact with Footlights had drawn me into spending many merry evenings with Douglas in The Baron of Beef public house, more or less opposite St John’s College, where he was studying – sporadically, he would doubtless have said – English. Had a piece of work that’s just come out in The British Medical Journal been published 40-odd years earlier I suspect I would have mentioned it at one of those gatherings – early on before rational thought took alcohol-fuelled flight. It’s interesting because it says we can put off dying from the things that kill most of us (heart failure and cancer) by what Jason Gill, Carlos Celis-Morales and their pals in the University of Glasgow call ‘active commuting’. By that they mean cycling to work is good. Physical inactivity (e.g., spending happy evenings in the pub) is bad. Had I mentioned it, rather than coming up with an entirely whimsical response to the “ultimate question of life”, Douglas would have spotted that the key to hanging on to life is “on your bike”. Just think: if Jason & Chums had got a move on, history would have been changed. Pondering all their evidence over several pints of The Baron’s best, it’s hard to imagine Douglas coming up with any title other than The Biker’s Guide to the Galaxy. But hang on: isn’t this just another pretty useless survey? Maybe – but for several reasons it’s hard to write it off. First, there have been quite a few studies over the years showing that cycling is good for you. Second, this is one was huge – so more likely to be meaningful. Using the UK Biobank data it looked for links between death and the way in which more than a quarter of a million people got to work. Third, and the thing that really caught my eye: the key finding stuck out like the proverbial sore thumb. Usually in surveys of things that might affect our health any trends are difficult to spot: eating X makes you live 10% longer or be 5% less likely to get Y … bla, bla, bla. But here you didn’t need to peer: cycling (a ‘long distance’) to work makes you 40% less likely to die – from anything! Below is just one bit of their data: I’ve re-drawn it with the cycling result in red but it hardly needs that to highlight the difference between it, walking (blues) and the ‘non-actives’ (green: car or public transport). It’s true, a bit of biking can help (orange: mixed mode cycling) but the really clear benefit comes from cycling (lots) – though they don’t actually say how many miles per day counts as ‘long-distance cycling.’ Modes of transport and distances were self-reported and the latter just divided into ‘long’ and ‘short’. How you get to work impacts your life expectancy. The figure shows the risk of death from all causes as hazard ratios (ratio of the hazard rates of death): the reference (hazard ratio 1) is travel by car or public transport (green). (From Celis-Morales, C. et al., 2017). So what of heart failure and cancer? 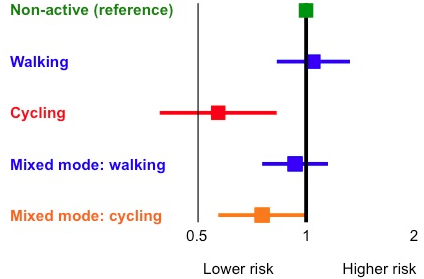 Perhaps not surprisingly then, commuting by cycling was also associated with a markedly lower risk both of getting heart disease or cancer and of dying therefrom. To give one specific figure: cycling to work lowers the chance of developing cancer by 45%. These are horrible studies to undertake, partly because they rely on human beings telling the truth but also because of what are called ‘confounding factors.’ For example, if someone plays a lot of sport and eats sensibly, you might guess they’d be relatively healthy, regardless of how they get to work. Conversely for smoking. However, Celis-Morales & Co did their best to allow for such things and therefore to come up with results that mean something. But, if you take their findings at face value there remains a key question that the authors do not mention: what is it about biking that’s such a life-saver (assuming you don’t get knocked-off and squashed)? It’s a real puzzle because walking is generally held to be very good for you whilst cycling is the most energy-efficient means of transport devised by man. Both activities use nearly all of your muscles, albeit that biking really works out your glutes and quadriceps, but because bikes are so efficient you use less energy. You can do the sums – i.e. work out how many calories used walking, running or cycling on Wolfram Alfra. It’s just confirmed that my daily bike commute does indeed use about half the number of calories required for the same walk. If you take your commute as training you would suppose that expending more energy (i.e. walking rather than biking) would strengthen your heart and cardiovascular system – and indeed this study shows commuters who did more than 6 miles a week at ‘typical walking pace of three miles an hour’ slightly lowered their risk of cardiovascular disease. But cycling was far more beneficial. As to cancer, beyond the simplistic notion that fitness = strengthening your immune system and hence capacity resist abnormal cell growth, it’s hard to see a mechanism for biking being so much better than anything else. Away with Ford Prefect and latter-day variants, automotive or otherwise! On your bike!! And if you can do it with a friend on a tandem, so much the better!!! Though if you’re going to do it à deux, it might be worth recalling that the Jatravartids had the wisdom to invent the aerosol deodorant before the wheel. And Now There Are Six!! Scientists eh! What a drag they can be! Forever coming up with new things that the rest of us have to wrap our minds around (or at least feel we should try). Readers of these pages will know I’m periodically apt to wax rhapsodic about ‘the secret of life’ – the fact that all living things arise from just four different chemical units, A, C, G and T. Well, from now on it seems I’ll need to watch my words – or at least my letters – though maybe for a while I can leave it on the back burner in the “things that have been but not yet” category, to use the melodic prose of Christopher Fry. The problem is down to Floyd Romesberg and his team at the Scripps Research Institute in California. 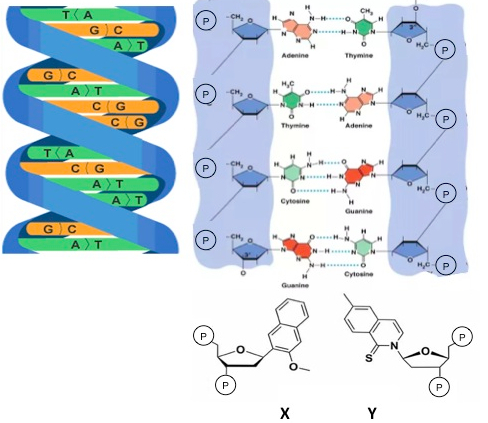 Building on a lot of earlier work, they’ve made synthetic units that stick together to form pairs – just like A-T and C-G do in double-stranded DNA. But, as these novel chemicals (X & Y) are made in the lab, the bond they form is an unnatural base pair. Left: Two intertwined strands of DNA are held together in part by hydrogen bonds. Right top: Two such bonds (dotted lines) link adenine (A) to thymine (T); three form between guanine (G) and cytosine (C). These bases attach to sugar units (ribose) and phosphate groups (P) to form DNA chains. Right bottom: Synthetic X and Y units can also stick together and, via ribose and phosphate, become part of DNA. After much fiddling Romesberg’s group derived E. coli microbes that would take up X and Y when they were fed to the cells as part of their normal growth medium. The cells treat X and Y like the units they make themselves (A, C, G & T) and insert them in new DNA – so a stretch of genetic code may then read: A-C-G-T-X-T-A-C-Y-A-T-… And, once part of DNA, the novel units are passed on to the next generation. If this has you thinking ‘creation and exploitation of entirely new life forms?! !’ you’re not alone. Seemingly Romesberg is frequently asked if he’s setting up Jurassic Park but, as he points out, the modified bugs he’s created survive only as long as they’re fed X and Y so if they ‘escape’ (being bugs this would probably be down the drain rather than over a fence), they die. Cunning eh?!! Is this coming to a gene near you? No. It is, however, clear that more synthetic bases will be made, expanding the power of the genetic code yet further. What isn’t yet known is what the cells will make of all this. In other words, the whole point of tinkering with DNA is to modify the code to make novel proteins. In the first instance the hope is that these might be useful in disease treatment. Rather longer-term is the notion that new organisms might emerge with specific functions – e.g., bugs that break down plastic waste materials. At the moment all this is speculation. But what is now fact is amazing enough. After 4,000 million years since the first life-forms emerged, more than five billion different species have appeared (and mostly disappeared) on earth – all based on a genetic code of just four letters. Now, in a small lab in southern California, Mother Nature has been given an upgrade. It’s going to be fascinating to see what she does with it! Zhang, Y. et al. (2017). Proceedings of the National Academy of Sciences 114, 1317-1322.